Related to the IAS-Research center, members etc. Date and time: April 9th, Tuesday, 11:30 a.m. Location: Carlos Santamaría Building, Room B14. Scientific non-reductionism emphasizes that the whole is more than the sum of the parts. Beyond metaphor, such holistic idea can be made concrete (namely, mathematically formulated and empirically testable) via the notion of entanglement, which is a foundational concept and an established phenomenon in quantum mechanics related to Heisenberg’s uncertainty principle (a fundamental limit to the precision of simultaneously measuring two complementary variables, like the position and momentum of an electron, which is not a consequence of experimental limitations). Here we present a classical analog of entanglement, where uncertainty relations arise from experimental commitments, like the selection of variables and/or subsystems, or ignorance about the context. Inspired by a theoretical work offering a definition of entanglement in a model of macroscopic brownian particles (Allahverdyan et al., 2005), we propose a general sufficient condition for epistemic entanglement that is valid for any underlying dynamics and any pair of macroscopic stochastic observables. Our bound reflects a trade-off between inter-vs-intra particle correlations, and only requires estimating dispersions. This makes it empirically accessible and also somewhat intuitive. We explored the origin of epistemic entanglement by taking advantage of analytical results available in brownian models and simulations of stochastic systems. Then, we applied our sufficient condition to behavioral data of fly courtship, and found entanglement between position and coarse-grained velocity. This result implies the existence of macroscopic correlations that cannot be effectively explained in causal terms, thus limiting the common cause principle. Our work also challenges the idea of pure objectivity, as our choice of measurement variables induced epistemic correlations that cannot be adjudicated to the observed system but that, through coarse-graining, belong to the observer. Date and time: January 22, Tuesday, 14:30 a.m. Date and time: February 12, Tuesday, 11:30 a.m. Date and time: February 19, Tuesday, 11:30 a.m. The paper distinguishes two senses of “epistemic opacity” in computer simulations, namely a qualitative sense and a quantitative sense, and explores their relation to actual simulating and modelling practices. From a qualitative point of view, the notion of “epistemic opacity“ in computer simulation seems to have the same significance and implications for any computer simulations. That is, from a qualitative point of view, computer simulations seem to be equally opaque —i.e. we open the black box, and find it (always) dark! In this sense “epistemic opacity” expresses the fact that when a computer simulation is performed there is an “epistemic leap” associated to it. This kind of epistemic leap is characteristic rather than of a specific model or simulation, of the fact that a simulation is performed. On the other hand, “epistemic opacity” can also be approached from a quantitative point of view. The questions to be asked then are rather different, e.g. is the “epistemic leap” noted above always of the same size? or are all computer simulations equally opaque, i.e. when we open the back box and find it dark, is it always as dark? The paper argues that (from this quantitative point of view), computer simulations display degrees of “epistemic opacity” (with the limit of non-opacity set in analycity). I will not discuss here whether these degrees of “epistemic opacity” can be measured (i.e. exactly quantified), or attempt provide a method for doing that. I will claim nevertheless that actual degrees of “epistemic opacity” are tightly related to what we can call the “complexity of the computational process”, which is associated for instance to the particular design of the computing software at work, specific computer settings, or to hardware limitations. With this idea of complexity in mind, I will claim, the more complex a computational process is, the more (quantitatively) epistemically opaque will the simulation result. I will note finally that a good deal of methodological decisions taken by scientist and modellers when performing computer simulations —i.e. typical tricks-of-the-trade such as parametrisation, use of expert knowledge, scaling, etc.—, which constitute an important part of current scientific practices in the field, are precisely aimed at reducing such complexity. I will conclude thus that actual scientific practices (or part of these, at least) in fact reduce (quantitative) “epistemic opacity.” This opens new and interesting questions such as whether actual scientific practices can manage to reduce “epistemic opacity” to the limit of analycity (thus eliminating “epistemic opacity” also in a qualitative sense), whether specific scientific practices can be said to reduce in some (qualitative) sense some of the uncertainties that computer simulations involve, or whether they have an impact on the reliability or confidence of specific computer simulations (possibly of the very same system). 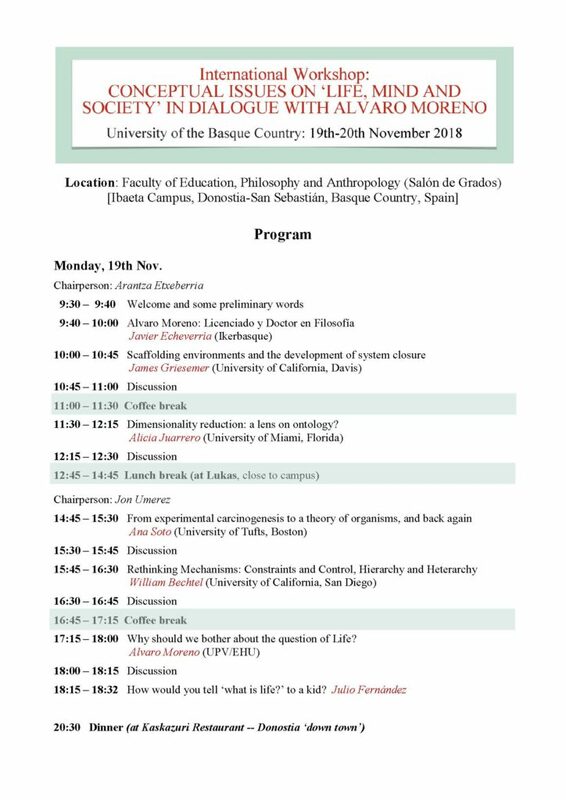 Date and time: December 18, Tuesday, 11:30 a.m.
Basing myself on work forthcoming in a volume entitled Philosophy of Biology before Biology (coedited w. C. Bognon-Küss), I argue for a conception I term ‘philosophy of biology before biology’, focusing on the theoretical ‘world’ or ‘context’ out of which the science ultimately called ‘biology’ emerged. This historico-philosophical approach to biology’s genesis is neither internalist study of biological doctrines, nor a reconstruction of the role philosophical concepts might have played in the constitution of biology as science; it looks more at the interplay between metaphysical and empirical issues. This study does not just have implications for understanding the relations between philosophy and biology in the mid- to late 18th century; it should also have an impact on our present understanding of philosophy of biology, given that it is necessarily conditioned by a very specific history and historiography (particularly evolution-centred). Further, ‘philosophy of biology before biology’ sheds a different light on our understanding of how biology as a science of life became unified. 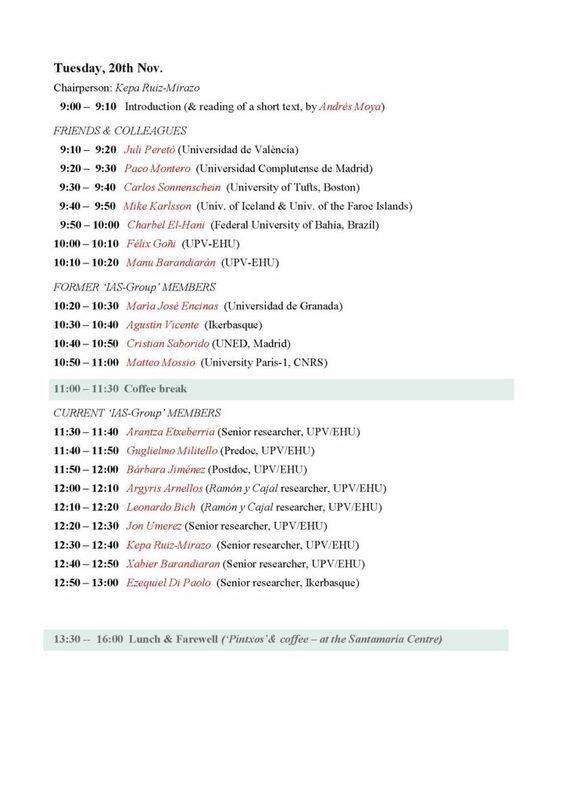 Keynote Speakers: William Bechtel (University of California San Diego), James Griesemer (University of California, Davis), Alicia Juarrero (University of Miami), Alvaro Moreno (UPV/EHU), Ana Soto (University of Tufts). Date and time: November 27, Tuesday, 11:30 a.m. Date and time: December 11, Tuesday, 11:30 a.m. I attempt to motivate an agent-centred ‘contact’ theory of evolution. I draw on debates in the philosophy of mind to illustrate a distinction between ‘foundationalist theories’ and ‘contact theories’. Traditional approaches to thought, perception, knowledge, linguistic meaning, are foundationalist. They start with the separation of an ‘inner’ mental realm from an outer realm, and posit mental ‘givens’ as the foundational elements. Foundationalist theories of the mind have well-known structural problems. Two, in particular, appear to be insuperable: (i) underdetermination (skepticism), and (ii) the missing agent. I argue that gene-centred evolutionary theory is also a foundationalist theory. It too suffers from the same problems. One prominent solution in the philosophy of mind is to adopt a wholly different kind of theory, a contact theory of the agent. I argue that a contact theory can have the same salutary consequences for the understanding of evolution as it does for mental phenomena. Date and time: September 25, Tuesday, 11:30 a.m.
Abstract: Epithelia are among the simplest mammalian tissues. Yet, little is known about how epithelial cells organize and orchestrate their fates (whether to divide, differentiate or die) to guarantee the turnover while preserving tissue homeostasis. Over a decade, theoretical models have been proposed according to which individual progenitor cell behavior would accommodate toautonomous, random fate choices, with remarkably good fits – at a statistical level – on lineage-tracing data from transgenic mice. It was my aim in this work to revisit these studies, and re-evaluate previous paradigms with an emphasis on bringing statistical-physics descriptions closer to the biological phenomenology at the cell level. By means of new experimental data and mathematical modeling, I will show how epithelial homeostasis can conform to simple rules where niche-sensing and collective cell-fate coordination play a predominant role. I would like to finish discussing how this domain of tissue-level communication would necessary constrain and impact on mutant clonal expansion, contributing to an internal control of tumourogenesis, letting the topic open for further debate. Date and time: June 26, Tuesday, 11:30 a.m.
Abstract: The concept of autonomy is fundamental for understanding biological organizationand the evolutionary transitions of living systems. Understanding how a system constitutes itself as an individual, cohesive, self-organized entity is a fundamental challenge for the understanding of life. However, it is generally a difficult task to determine whether the system or its environment has generated the correlations that allow an observer to trace the boundary of a living system as a coherent unit. Inspired by the framework of integrated information theory, we propose a measure of the level of integration of a system as the response of a system to partitions that introduce perturbations in the interaction between subsystems, without assuming the existence of a stationary distribution. With the goal of characterizing transitions in integrated information in the thermodynamic limit, we apply this measure to kinetic Ising models of infinite size using mean field techniques. Our findings suggest that, in order to preserve the integration of causal influences of a system as it grows in size, a living entity must be poised near critical points maximizing its sensitivity to perturbations in the interaction between subsystems. Moreover, we observe how such a measure is able to delimit an agent and its environment, being able to characterize simple instances of agent-environment asymmetries in which the agent has the ability to modulate its coupling with the environment.